Can you imagine a Paradise hidden away in the mountains of California? To some people, the "Giant Forest," located inside Sequoia National Park, fits this description. It was only after the inventions of machinery, which created roads and automobiles, that it became possible to access this remote area. Thus, ordinary people came to know this hidden paradise. The Sequoia Park was created in 1890 to protect the large Sequoia trees from being cut down. Previous to this, a near-by area (above Fresno, inside Kings Canyon NP) that had large Sequoia trees was mowed down by loggers. In the early 1900s, the first Giant Forest Village was created. This village was in a prestigious (Gem) area in Round Meadow in the middle of a Giant Sequoia Grove. This new village had a dining hall, a lodge, post office, and many camping sites. 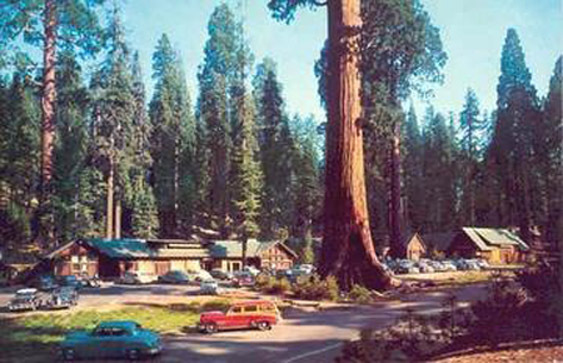 This village as well as the second revised village (est 1926) was created for people to enjoy quality vacationing among the large Sequoia Trees. This included camping, lodging, basic needs and a place to eat/drink. It was built only for human needs, supplementing the Giant Forest. It was not meant to be the main attraction for coming there. Naturalist John Muir visited Giant Forest and camped with discoverer Hale Tharp. He named it Giant Forest and wrote that it was good to sleep among the big trees. He didn't say just look at them but spend time there including camping. The village was built to be as non interfering and woodsy as possible. The early NPS carefully planned these villages to help make Sequoia a better park and in those days they cared about visitors and people. There are other groves of large Sequoia trees nearby but their remote to the average visitor. One of the great qualities of the village was making a paradise for vacationing away from the stresses of normal life. During the depression of the late 1920's and 30's Giant Forest Village was highly used to help people re-adjust to their hard times and provided a haven to get their minds healed. Somehow Giant Forest has a spirit of peace about it and you get refreshed from what ever stresses you out. To read the history of how Giant Forest Village came about, click on the history link.